Digits is an innovative new solution that gives cryptocurrency users the ability to use their regular fiat-based credit or debit cards as cryptocurrency cards to facilitate seamless crypto payments. There are two main problems that the market faces with regard to paying in cryptocurrency. The first problem is the slow settlement times witnessed in many digital currency networks. For instance, the bitcoin network is able to handle a significantly smaller number of transactions per second in comparison to traditional payments systems like Visa or Mastercard. The second issue is the high price volatility experienced by digital currencies. Merchants who accept cryptocurrencies as a payment method directly may find themselves generating unnecessary losses due to cryptocurrency exchange rate risk. 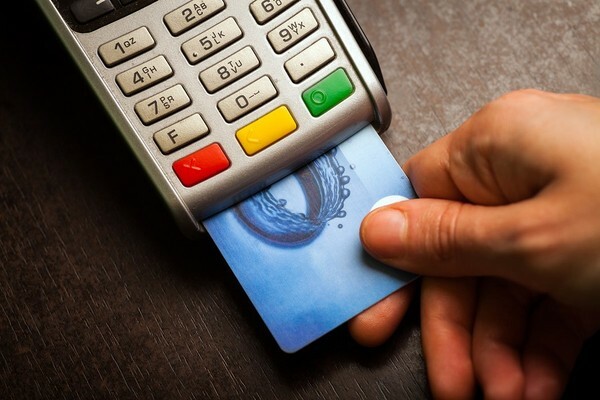 Digits turns any credit or debit card into a crypto card. In order to effectively address these challenges, the Digits team has created an innovative solution called the Hedge Lending Network. The Hedge Lending Network is a pool of funds through which payments can be settled in an instantaneous manner, as is the case with traditional fiat payments. When a customer initiates a transaction that uses cryptocurrency as a mode of payment, the Digits API moves funds from the user’s wallet to a custodial wallet operated by the company. Following this, the Hedge Lending Network automatically deploys a smart contract that uses the user’s funds as collateral. This smart contract is the tool through which merchants receive their payments. The crypto funds are held for a pre-specified amount of time after which they are liquidated in order for Digits to recoup its funds. Alternatively, the user is able to choose to pay back the loan in fiat currency and keep his digital currency. This process happens seamlessly behind the scenes. Users are able to access easy and secure cryptocurrency payments while merchants are able to capitalize on new sales by enabling digital currency payments. Moreover, merchants do not have to adapt to new practices as the back-end is entirely handled by the Digits platform. The Digits platform will have a native cryptographic token with the same name. The Digits Token has the ticket DSI and is a security token with a future utility application within the Digits network. 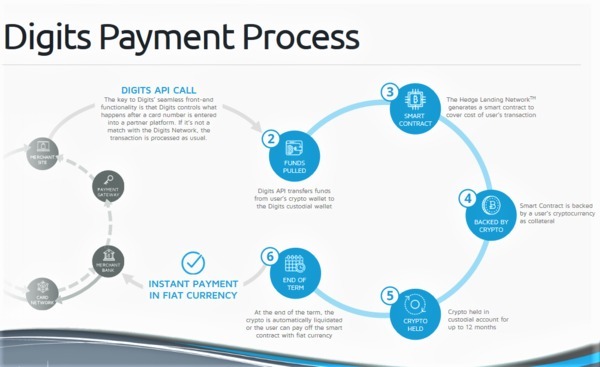 Merchants will need to use the DSI to pay for the right to use the API provided by the digits platform. The more people who use the token, the higher the value of the token will grow. The maximum supply of the coin is capped at 1,000,000,000 units with 550,000,000 set to be distributed during the ICO. The ICO is scheduled to launch on September 1, 2018, and will run for a one-month period. During the token sale, the startup aims to raise $50 million for its innovative crypto payments solution and will accept BTC, ETH, and LTC as currencies. If you would like to participate in the Digits ICO, you can pre-register here. Tokens will be sold at a discount pre-ICO, and a bonus sale will run from the first through the sixth day of the of the sale.